For office parties and family gatherings Truffles is the ideal venue for between 6 to 24 persons. Please make meal selections at least five days prior to your visit to assist ordering supplies. To secure advance booking send a £10 deposit. A discretionary service charge of 10% will be added to all bills. The Christmas Party menus are available for either lunch or dinner throughout December till Saturday December 24th 2016. We are closed Sundays and Mondays unless a specific advance booking request is made. Advance bookings can also be made for Christmas Day lunch at £65 per person (children under 12, £30) and New Year’s Eve dinner at £40 per person. Menus for these will be posted on www.trufflesbistro.co.uk. To make a booking please call Barbara or Richard on 01749 812180 or email . 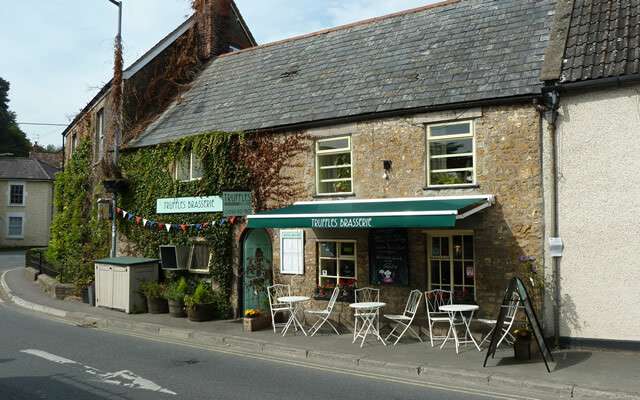 Truffles Brasserie, 95 High Street, Bruton, BA10 0AR.